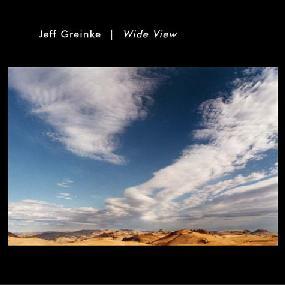 Jeff Greinke - "Wide View"
Let me start off by saying that I’ve been a Jeff Greinke fan for years. I have seen Jeff perform solo a number of times, I have seen him perform with LAND (his art rock band), and I saw his farewell show in Seattle with Rob Angus (he has since moved to Tucson). Jeff is one of the top 5 ambient artists working today. He also does edge music (atonal out there stuff) and works very well in a band situation. Having said all that, currently Jeff has been moving away from strict ambient textures and has been adding looped rhythms to his compositions. It’s a new direction for him. While I like the new stuff, like many fans of many styles of music, I really like the old stuff. So, when Jeff sent me his new CD I was really shocked to hear... OLD STUFF! Ambience and lots of it, literally dripping out of my speakers. I was in heaven. It’s sort of a culmination of Jeff’s musical endeavors, since the straight ambient stuff is something he doesn’t do much any more. It’s much more structured (as much as ambient can be), it’s more melodic - less washes and drones, and it has a real foreground feel (most ambient music, Jeff’s included, has more of a background feel, kind of an edge of consciousness thing). An odd thing that struck me while I was listening is that this CD has a performance feel to it. A kind of you-are-there vibe. That’s my ramble. An incredible performance. If you are a fan of Jeff’s music or a fan of ambient, this is a must own. If you get a chance to see Jeff, now that he’s in the Southwest, do not miss it. Finally, exceptional artwork with great photographs by Isabel. For more information you can visit: http://www.hypnos.com/greinke.